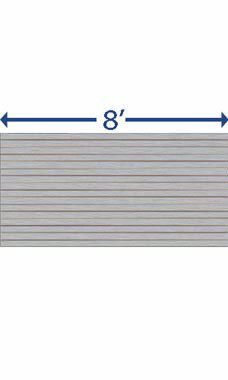 These Brushed Aluminum Horizontal Slatwall Panels are made of 100% recycled materials and have no added formaldehyde. The finish provides a stunning display option for your merchandise. You can also add accessories to enhance the display performance such as slatwall shelves, brackets, faceouts, peg hooks, and other display options. Panel dimensions are 4'H x 8'W x 3/4," 3" O.C.